1-Per Page or 2-Per Page Cheques are great for keeping around the office or taking with you in the available cheque binders. Manual cheques offer clients a low cost alternative to printed cheques as there is less paper used so the cost to print and manufacture is reduced. 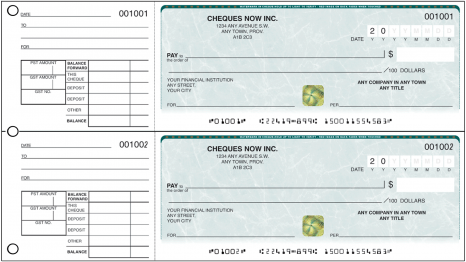 The portability of this style of cheque also makes them great for small companies who may need the ability to issue cheques when on the move. Cheque binders offer a secure way to transport cheques from Job sites and back to the office as the special cheque binders with 3 rings keeps your stubs in the binder as you travel around. As far as costs go manual cheques offer a savings of around 45% as compared to laser cheques. This cost savings is extended even further as our standard offer to our clients is to also provide you with 50% more cheques for Free on every order. A basic example is ordering 200 cheques for $117 and we will ship you an additional 100 for no cost! Even though these cheques cost less they carry just as much security as computer cheques. Our manual cheques come standard with the Gold Hologram Foil, plus heat sensitive ink on all orders. This is in addition to Micro Printing, Toner adhesion, Chemical sensitivities etc that come standard. Another point to consider when buying manual cheques is to look at how many bank accounts you use. Several of our clients have multiple accounts such as general accounts, trust accounts and commission accounts. We carry 5 standard cheque colors which allows you to visually tell your accounts apart. We can also add an extra prefix in front of the cheque number as well if you’d like that at no extra charge. If you would like any additional information or pricing please don’t hesitate to contact us.